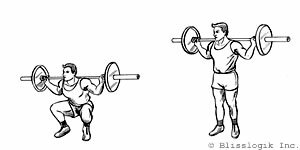 Leg Exercises are weight training exercises that are designed to strengthen the muscles located in your lower body (i.e. thighs, buttocks, hips, calves). 1 - The Quadriceps are found in front of your thighs, below your hips and above your knees. 2 - The Hamstrings are found at the back of your thighs, again below your hips and above your knees. 3 - The Gluteals are the muscles located in your buttocks. 5 - Finally, the Calves are located at the back of your legs, below your knees and above your ankles. Your leg muscles are involved whenever you are walking, rising up or walking down a flight of stairs, lifting yourself or objects from up the floor. All in all, the muscles in your legs are involved throughout your day-to-day activities. Rising yourself up from the floor will require the quadriceps and the glutes to work together whereas your calves will be involved whenever you push on your toes to raise yourself up. 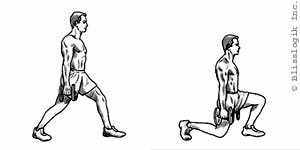 Finally your hip flexors will be solicited whenever you are raising your legs up or pushing or pulling them to either sides of your body. 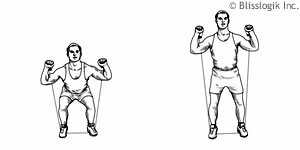 As with most fitness exercises, leg exercise will require the assistance of neighbouring muscle groups. 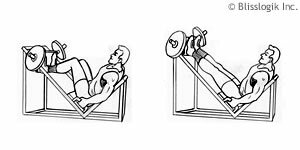 In most cases, performing leg exercise will either require the help from either your back or abdominal muscles, and oftentimes both at the same time. Finally, leg exercises can be performed using a variety of different workout equipment, whether you work out at home or at a professional commercial gym. 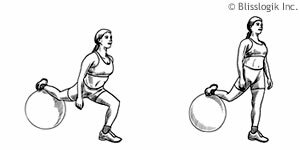 For example, there are plenty of leg exercises for which you would only need one of the following equipment type: a barbell with accompanying weight plates, a pair of everyday dumbbells, an exercise ball (also called swissballs) and finally isolated gym-type equipment custom-built for exercises in particular.